Fit Momma of Four: P90X3 Exclusive Test Group! Is this Exclusive P90X3 test group the right fit for you? Read on to find out! 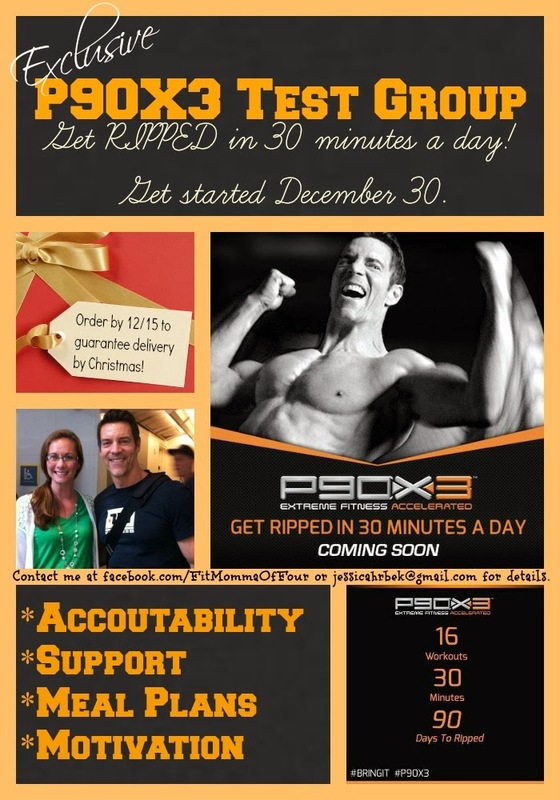 *Are you a P90X or P90X2 graduate & hungry for some more Tony Horton? *Did you try P90X or X2 & quit because the workouts were to long or because you were not good at keeping yourself accountable? *Have you be interested in trying P90X but knew you could never find 1 - 1 1/2 hours a day to workout? *Do you need some extra accountability, motivation, support, and help with healthy meal plan & recipe ideas? *Are you interested in getting in the best shape of your life in just 30 minutes a day? If you answered YES! to any of these questions then this Exclusive P90X3 Test Group just could be the answer to your workout woes! *P90X3 is a 90 day fitness program with world-renowned trainer, Tony Horton. *16 new 30 minute workouts on 8 DVDs. *The P90X3 program is split into 3 Blocks. Block 1 & 2 are each four weeks long. Block 3 is five weeks long. *Workout ranging from cardio, strength, pilates, yoga, MMX & more...you'll never get board! P90X3 is full of new moves & exercises to maximize your results in just 30 minutes a day. *As Tony Horton says himself, "It's not easier, it's just faster!" What are the BENEFITS of being part of the Exclusive P90X3 Test Group? *Individualized support from me, your coach! *Support, motivation, & accountability in the closed P90X3 Test Group Facebook Group. *Clean eating recipes & meal plans. *Working with a support system makes you 80% more likely to stick to new fitness programs! What are the requirements to be part of the Exclusive P90X3 Test Group? *Test Group participants must commit to completing the P90X3 program, beginning your workouts on December 30, 2013. *You must replace one meal a day with Shakeology. *Sign up to have me as your coach. Please go to www.beachbodycoach.com/JESSHRBEK to set up your free membership now! How can I get P90X3? *P90X3 will be available for purchase on Tuesday, December 10. To be the first to know when X3 is available for purchase sign up for your free membership with the above link. You will receive an email as soon as the sale is open! December 10-31 only, the P90X3 challenge pack will be on sale at the introductory price of $180 (the challenge pack price will go up to $205 Jan. 1). In the challenge pack you will receive the 90 day P90X3 workout program, nutrition guide, program manual, schedule of workouts, a 30 day supply of Shakeology, free 30 day club membership, and FREE SHIPPING. You save over $65 when you buy the P90X3 challenge pack versus buying the program & Shakeology separately. *If you are looking to purchase P90X3 for a loved one's Christmas gift, be sure to place your order by Dec. 15 to ensure delivery by Christmas. What are the benefits of purchasing through me, your Beachbody coach? *You secure your spot in the Exclusive P90X3 Test Group, beginning Dec. 30, 2013. *By purchasing P90X3 through me, your Beachbody coach, you will get a FREE P90X3 hat. What better way to show everyone that you are doing the newest, hottest workout in town? 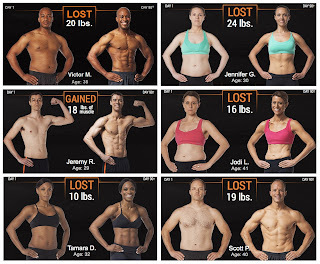 These are some of the results from folks who tested out P90X3 while this program was being developed.